On February 9th, the Ambassador of the People’s Republic of China to Barbados, H.E. 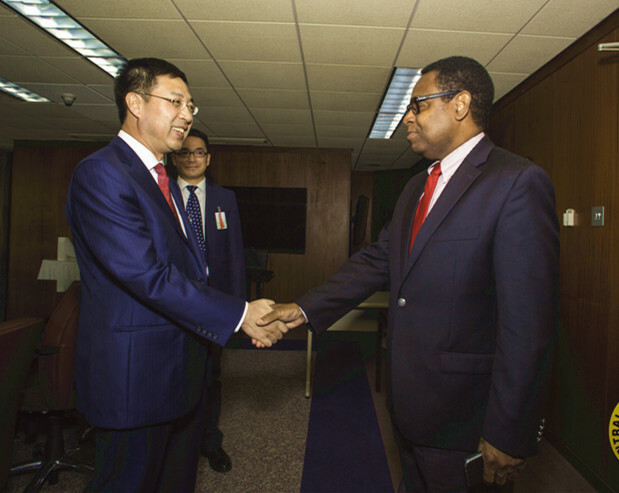 YAN Xiusheng paid a courtesy call to the Governor of Central Bank of Barbados, Mr. Cleviston Haynes. The Political Counsellor of the Chinese Embassy, Mr. ZOU Xi and the Deputy Governor of the Central Bank of Barbados, Dr. Woodroffe attended this meeting. Ambassador YAN reviewed the fruitful pragmatic cooperation between China and Barbados in all fields including economy and trade, culture, education and health care in the past 41 years, especially after H.E. XI Jinping, President of the People’s Republic of China, met with the Right Hon. Freundel Stuart, Prime Minister of Barbados in Trinidad and Tobago. Ambassador YAN thanked the Central Bank of Barbados for the long-standing support of the Fish and Dragon Festival in celebrating the Chinese New Year. This festival which jointly held by the Chinese Embassy and the Central Bank of Barbados has not only become the biggest platform for Barbadians to experience the Chinese culture but also a vivid demonstration of the tightened people-to-people exchanges and friendly cooperation between China and Barbados. Governor Haynes welcomed Ambassador YAN to Barbados and expressed that the comprehensive cooperation in trade and investment areas between the two countries significantly benefits the development of Barbados. It is without doubt that more potential can be explored for cooperation opportunities in economic and financial areas between Barbados and China to further deepen the win-win cooperation of the two countries.